You can export your store data as the Google Shopping Data Feed format – tab delimited .txt file. To do that, choose the “Google Shopping Data Feed” in the dropdown next to Export button. The exported fields will match Google Shopping Data Feed specification, with some special ways how to fill in fields that are not normally available in Shopify. If you export Products with “Metafields” checkbox, then the values will try to be set firstly from the “mm-google-shopping” Metafields. 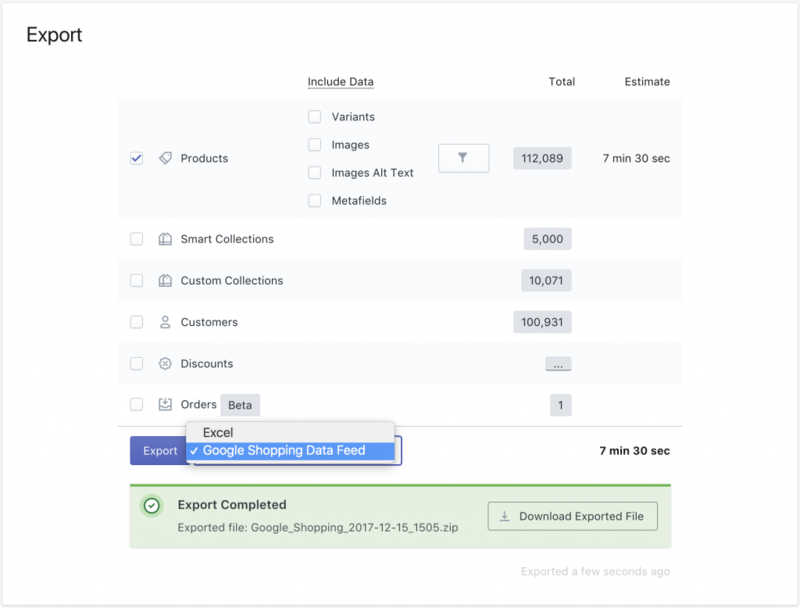 If you want to gain export speed, especially for large stores with around million of Products, then set up your data so that you don’t have to rely on those Metafields – for the fastest export. To switch to long ID format, ask Support. Product Title if variant has no title. URL to the Product variant page in your store. All product images, except the variant image because it is already in the image link. Will show “in stock” if variant inventory quantity >0, otherwise will show “out of stock”. Product variant price with your store currency. If this variant has compare at price, then price is set to compare at price. Product price, if variant has compare at price. Empty, if variant doesn’t have compare at price. Google requires this field to be filled in according to Google Product Taxonomy. If your Product Type will match the deepest level of that classifier, then that will be used. In this example, if your Product Type will be “Shoes”, then the Google product category will be “Apparel & Accessories > Shoes”. If any of your Product Tags will match the deepest level, then that will be used. In this example, if any of product tags will be “Shoes”, then the Google product category will be “Apparel & Accessories > Shoes”. Guessed from different fields the following way. Big or small letters don’t matter. Also _ (underscore) can be used instead of space in the name. If any of product Tags will be like “Energy Efficiency Class:A+++”, then “A+++” will be taken from that. If any of product Tags will be like “age_group:infant”, then “infant” will be taken from that. Guessed from different fields the following way. Big or small letters don’t matter. If any of product Tags will be like “color:green”, then “green” will be taken from that. If any of product Tags will be like “gender:male”, then “male” will be taken from that. If any of product Tags will be like “material:gold”, then “gold” will be taken from that. If any of product Tags will be like “pattern:dots”, then “dots” will be taken from that. If any of product Tags will be like “size:XS”, then “XS” will be taken from that. If any of product Tags will be like “size type:regular”, then “regular” will be taken from that. If any of product Tags will be like “size system:EU”, then “EU” will be taken from that. Product Variant weight expressed in grams. Taken from Product Metafield “Metafield: mm-google-shopping.custom_label_0”. You don’t have to have all data filled in. If it will not find the appropriate value, it will just leave it empty. To decide, what values are needed in which cases, please, consult the Google Shopping Data Feed format specification – there are detailed descriptions for each fields, and their allowed values. To make export run very fast for large stores, don’t rely on Metafields, but store those values in Tags and Options. You can update the Metafields by importing with Excelify those values, as explained in this tutorial. If any of this information is unclear, or you need it to be different, ask our Support, it’s quite easy customisable.